Escaping the city was made a tad bit more difficult due to flooding. Saturday the weather straightened out and it was one of those perfect Fall days. Glorious. Low humidity and the clear air with a touch of that cool crispness which will only increase over time as we get nearer to the end of the year. Anyway, I got out the "Bubblegum Princess" and prepped for a journey out into the country. I had been thinking that I was getting a bit bored with the same routes all the time. I needed to do something different. I didn't leave time to research a route and make cues, so I was in a bit of a bind. Rides I know from memory are the same ones I was trying to avoid this time! What to do? I figured I could ride the planned Geezer Ride route which never happened, but I wasn't thrilled about that direction. Then it came upon me what I should do. Back when I rode mountain bikes almost exclusively, we used to do this thing where we would ride our typical loop backward. Then it became a "new route" because everything was backward and reversed from "normal". Climbs were descents, lefts were rights, and descents were climbs. Plus, you saw the route completely differently. You noticed things you had passed by a million times and hadn't seen before. I decided to employ this scheme and ride the old 3GR route clockwise instead of anti-clockwise, which was the way I had always ridden that route. I couldn't believe I hadn't tried it the other way before. Now that said, there were parts I had ridden both ways, but much of it I hadn't, so I was excited to try this out. The fields are turning gold and brown, and the sky was marked with wispy clouds. I headed out of town North with the goal of using Burton Avenue to get to Bennington Road which was a way we would sometimes come back into Waterloo. Great idea, but getting there wasn't made easy by the major flooding of the Cedar River, which cut off several lower lying streets to my use. I eventually worked my way through some strange to me neighborhoods and linked up with Burton. Heading North, I then realized I was bucking a head wind. It won't be long before the harvesters will be busy in those fields out there. The ride out on Burton to the gravel confirmed that the wind was going to be a factor. I couldn't tell just then exactly what direction it was coming from, but my thoughts were that I should have an easier time of it on the way back in. That was great, as I typically would have chosen to ride out into the wind first anyway. Then also, I wasn't trying to push super hard, or hard at all, since I didn't want to undo the good rest to the legs which I had gotten. Shift early-shift often, and keep things chill. I turned onto Bennington Road, going West, and then I knew it was going to be rougher than I thought. The wind was coming out of the Northeast. More East though, as I was flying with little effort going West. Bummer! Maybe coming South would be a crosswind. I just settled in for a long ride of grinding it out. Two miles of easy West and then it was North up Streeter Road. Now Streeter is hilly, and coming North I had to grind a long, long grade we generally coast down. Fresh gravel made the grind tougher. Steady as she goes! Make a rhythm and stick to it. The climb wasn't too bad, and I ended up on the false flat going across the county line. The dark smudge on the horizon ahead was the Denver Hills, and the road seemed to drop off to nothingness as I approached. Looking back at the closed bridge on Ivory Road. I took this shot over my shoulder! The sign said "Road Closed Ahead", but somehow we gravel riders interpret that to read "Adventure Ahead!" Ha! Well, I knew that Ivory Road has a closed off bridge, but the approach has been half bulldozed away, not sure why, and my friend Tony had reported that the road was washed away in a couple of sections due to the recent heavy rains. I was on the lookout for this as I descended into the creek valley. Nasty section of washed away gravel road. You wouldn't want to hit that at any speed! The washed away section was nasty. Pretty deep drop off and into big, loose, baby head limestone. No good way to navigate through that, but fortunately there is a bit of margin to the West side which is ride-able. After that it was up, up, and up. The climbing section was beginning! This part leads you to a left turn, up a big grinding climb which bends to the right, then a right turn on Hilton and the big rollers going by the Boy Scout Camp. Those rollers are steep! Then you come out to a bit less steep rollers but it doesn't stop with the up/down until you finally reach the hard right hander and then the turn where Hilton goes back North, only the route goes East and straight ahead. It's at that very point where there is a staple of the 3GR route I haven't written about here. That would be the small dog tied to a post outside of a dog house. He's been there for years. He barks and goes berserk every single time I've ever ridden by there. Poor thing! He's barked so much his voice is hoarse. I've a mind to cut the critter loose and set him free, but my friends with "dog knowledge" say that's as bad as tying him up forever, so, I don't know about that idea. Anyway, it's amusing and heartbreaking all at the same time. So, then it was straight East and into the teeth of that wind. It was okay, just a bit slower going and I had to take it easy up the longer grades which feature into Ivanhoe Road. But right before I made it there, I stopped to take a rest and to take in the beauty of the area with all those leggy, yellow flowers waving in the breeze. This would have been right at the corner of Ivanhoe and Ivory. Just before the passing under the trestle bridge which used to carry a rail road, but now carries the bike path from Waverly to Readlyn. Ivanhoe Road looking Southeast where it goes underneath the trestle bridge. 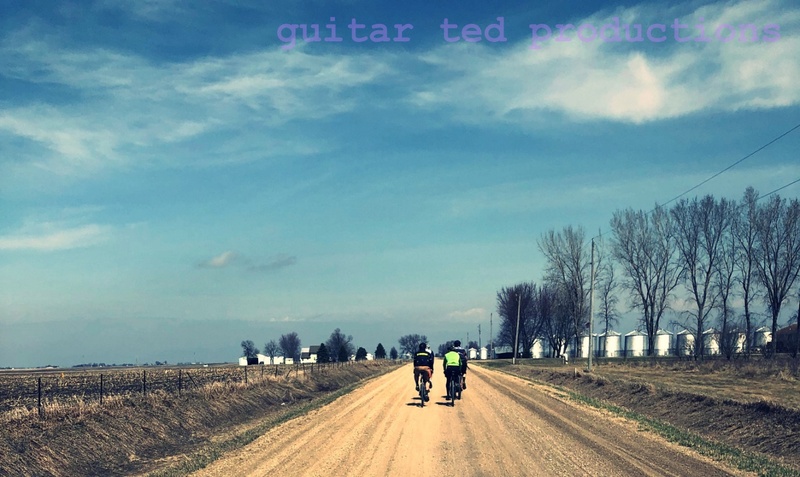 The passing of Highway 63 was met with another long grade to get up against the wind. I was looking forward to going two more miles to Navajo Road and getting out of the blast. I was fairly sure that heading South would be easier than going East on this day! However; remember when I said that going backward on a route can sometimes show you things that you missed going the other, "usual" way? Well, when I got to Midway Road, where we used to come off going North and turned right, against the way I was coming, I looked North and saw something I never noticed in maybe a hundred times of going up here. Cemetery headstones in a field! Was there a rural church just north of the intersection? Why hadn't I ever noticed this before? Well, I had to turn North, even though I hadn't meant to go that way at all. Once the sight of a German church? Most likely, yes. I saw the cemetery gates and I knew I had to "bag" that photo. I have been doing this for the last few years. Everytime I come across one of these rural cemeteries with a gate, I get my bike in the middle of it and snap off an image. This one was unique for the big, empty space before the cemetery proper. I hypothesize that this empty space was where a church once was. Many rural churches had the cemeteries in the rear of the church, or off to one side or another. In the back is most common with Lutheran churches in this area though. This being an obviously German cemetery, it most likely was Lutheran. Some online sleuthing turned up that there was a church in this location. The church was founded in 1861 and moved to Denver, Iowa in 1902. According to a plat map of the township dated 1894, St. Paul's's also had a school on premises as well as the church building proper. That would account for such a large, empty space here today. A patriotic themed barn quilt as seen on Sage Road. Once I left the cemetery I headed North and caught the bike path going East again. I couldn't just go a mile North, as that is Highway 3, so I would have ended going a minimum of two miles North and at least five miles round trip to get back on route. But I wasn't in to seeking out many more miles, so I bailed off on the bike path. That led me to Navajo Road and back on track, headed Southward. The Southward direction I was headed in was easier, thankfully. I was cruising along at a pretty decent clip, but my legs were feeling tired after pushing up hills, grades, and against the wind for most of that. I decided to just head straight down Sage Road to Airline Highway, make a right to Moline Road, then left the rest of the way into Waterloo. Before I got far though, I had a dog encounter. Two dogs came out from a farm yard, one a grizzly looking old yellow lab and the other looked to be a mix of a Boxer and American Terrier. Both were the same size. The Lab was barking with a weird, higher pitched, slightly fuzzy sounding voice and the other dog was just looking as if it would rather play than fight. My worry was with the yellow one. As I stopped the Lab got behind me, which is generally what a dog does when it is afraid and sometimes they will snip at you from behind becuase of their instinct. This one just sniffed and barked though. The other dog actually approached me from the front and looked as if it wanted to be petted. It licked my shin and my hand but as the other dog was barking it seemed unsure what to do. Finally the owners came out and the situation was diffused, but the yellow dog wasn't ready to let things go. I eventually got away with apologies from the farmers and a nice wave goodbye. Then I made my way back to Waterloo with no further incidents. Once back in town though, I had to re-route due to a train parked across 4th street. That tacked on a couple miles so I ended up with 44 plus miles on the day. It was a good ride, and my legs were glad it was over. That's a great start to my getting ready for the ICGravel event coming up on October 27th. Hopefully I can get in a lot more rides like this. Sounds like you got a good work-out Mark. I always feel good when I can get in a 40 miler which is, usually, about the limit for my 61 year old legs. My usual get out for a little while rides is closer to 13-15 miles. I had surgery a few days ago, so my rides are probably not going to materialize for a couple weeks. Glad you got to get out. Doc. @Steven Butcher- Oh! All my best to you for a speedy and complete recovery. Sorry that you cannot get out there and ride now, but hopefully you'll be able to safely soon. I recently turned around one of my long time regular routes backwards for the first time. Totally threw me for a loop. I didn't know the climbs, was second guessing the turns. Saw buildings I'd never seen before. Amazing how different it can be.